"Two lemony layers and a third layer of whipped topping make this an easy dessert after a light summer dinner." Beat pudding mixes, milk and juice with whisk 2 min. (Mixture will be thick.) Spread 1-1/2 cups onto bottom of crust. Whisk 1/2 the COOL WHIP into remaining pudding mixture; spread over pudding layer in crust. Top with remaining COOL WHIP. Size-Wise: This lemony pie is the perfect choice for a spring or summer celebration with friends or family. 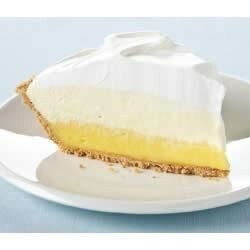 Triple-Layer Lemon Meringue Pie: Try our meringue-topped version Triple-Layer Lemon Meringue Pie. Substitute: Omit lemon juice and prepare as directed, using JELL-O Pistachio or Vanilla Flavor Instant Pudding. Special Extra: Top with 1/2 cup sliced fresh strawberries just before serving. Special Extra: Garnish with lemon zest. real weird. didnt like it. maybe if it was chocolate pudding it would have been better. This pie is okay. I used sugar-free fat-free pudding, so I don't think mine set as well as it should have. The top layer tasted great when first made, but not as great once it set. This one is a inner. So easy. So good. My wife is diabetic, so I used sugar-free pudding and lite Cool Whip. It did fine. The kids made this pie(with a little help)and it's so easy to make. I don't think you could screw it up. Everyone loved it.